More than 15 cents per mile. That’s what it costs a fleet on average for maintenance and repair, according to the American Transportation Research Institute. That equates to about 10% of a fleet’s vehicle-based operating costs. Currently fleets are conducting 75% of their maintenance in house, according to Molly MacKay Zacker, vice president of operations at MacKay & Company, a market research company for the trucking, construction and agricultural equipment industries. 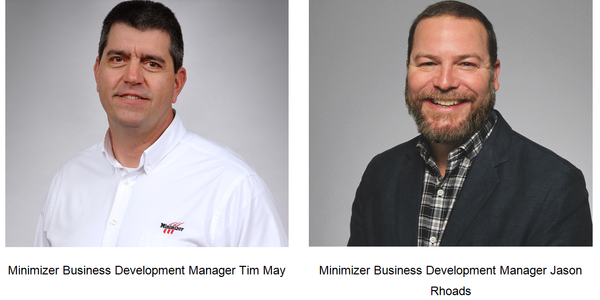 However, when her firm surveys fleets every four years in its Truck and Trailer Service Study, fleets indicate they want to outsource more of their service work — yet the percentage of in-house service continues to remain steady. MacKay’s predictions are that in 2020, 68% of the 672 million service labor hours will be handled in house. 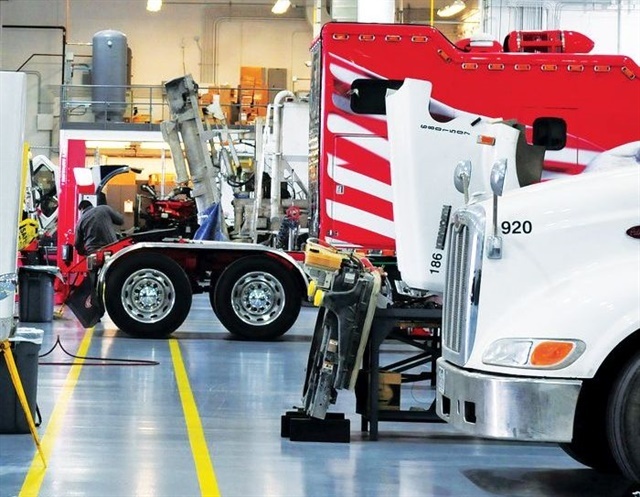 However, as trucks continue to get more complex and as there continues to be a shortage of qualified technicians, more fleets, especially small to mid-sized fleets, may find they need to outsource at least some of their service work. 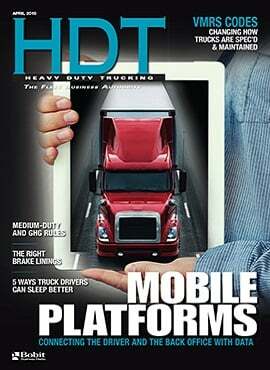 For some fleets, it’s about dealing with the increasing complexity of trucks. Before beginning the process of finding the service provider that best meets a fleet’s needs, a fleet manager needs to do some homework on the fleet’s operations. 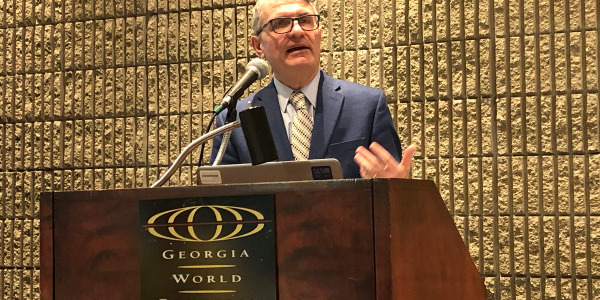 “Fleets that truly understand their costs have the data they need to perform the deep analysis that is required to reach the best conclusions about meeting their maintenance needs,” Dawson says. 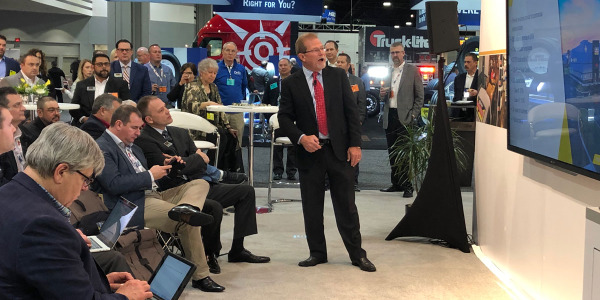 Victor Cummings, vice president, service operations, for mega-dealer group Rush Truck Centers, says before fleets review outside service providers, they need to look at their truck utilization, including what percentage of the fleet is out of service each day, as well as the business dynamics impacting downtime. Once you’ve looked at that, he says, you can “evaluate your internal inefficiencies and lost revenues versus [your] maintenance budget. 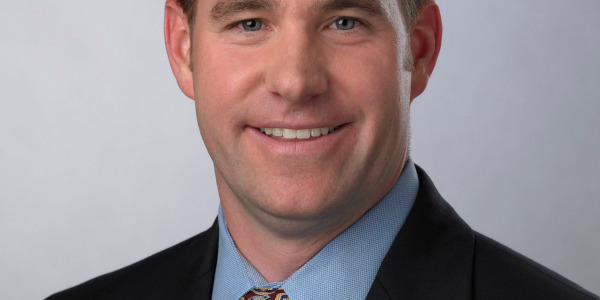 Shane Gilliam, vice president of sales at Noregon, which offers diagnostic, repair, and data analytic solutions, says fleets need to assess their own capabilities to determine which work they have the ability to handle themselves. Then they need to ask themselves if they are willing to invest money into shops to get them to where they need to be. Once you really dig deep into the costs, you may find it’s not really cheaper to do it yourself. 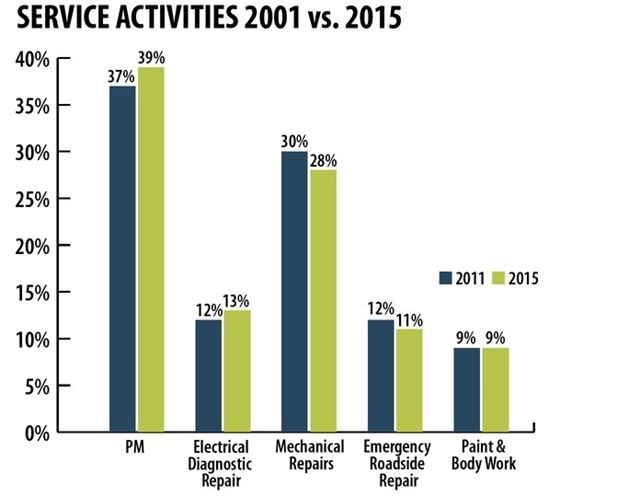 MacKay & Co.’s data shows that while fleets want to outsource more, most continue to do their own maintenance and repair work. 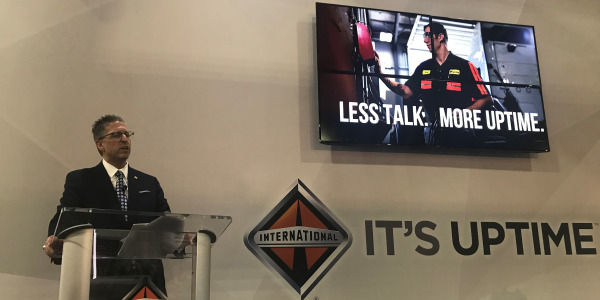 “Sometimes we may lead ourselves to believe we are more capable than we are and that we can save money by doing it ourselves, when really all we are doing is adding additional costs to the operation,” says Bruce Greer, president of Kroeger Equipment and Supply, a provider of aftermarket parts and service. He believes if the vehicle has to be hooked up to a laptop to clarify or validate a fault code, it needs to go to an outside repair facility. After determining which service work to outsource, it is important for both sides to define expectations. Above all else, Gilliam says, fleets should expect on-time repairs to minimize downtime. “There should also be an expectation that everything gets fixed correctly the first time, ensuring a return trip will not be necessary,” he says. Greer says he tries to live up to customers’ expectations to get in and out of the shop as quickly as possible. 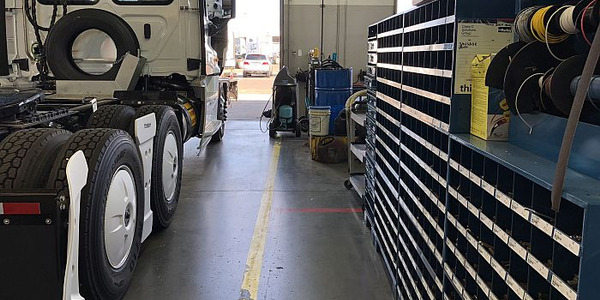 “We try to get the truck in the bay within an hour to determine the problem, give them an estimate of how long the repair will take to complete, and when we can start on it.” He also has hired a retired technician to perform post-repair quality checks. 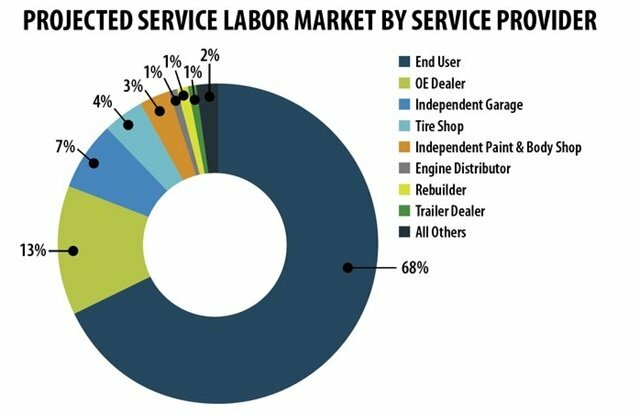 Preventive maintenance continues to be the lions’ share of service work, but electrical diagnostics and repair are on the rise, according to MacKay & Co.
Tim Grabow, vice president of Blaine Brothers, a heavy-duty truck and trailer service provider, urges fleets to pay close attention to the way a shop runs its labor rates. “Quite honestly labor rates, in my opinion, are an illusion.” For example, one shop with a labor rate of $100 an hour uses Standard Repair Times that say a wheel seal job should take 2.5 hours. Another shop may tell the fleet their labor rate is $75 an hour, but if they don’t use SRT they might charge four hours of labor. “Instead of asking a shop what their labor rate is, ask them how much they charge to do a brake job, for example,” he suggests. Riemer cautions that as a fleet moves to an outsourced service model, repair costs initially may go up, but they should go down over time. “Deferred maintenance is a huge liability that fleets rarely if ever capture adequately,” he says. 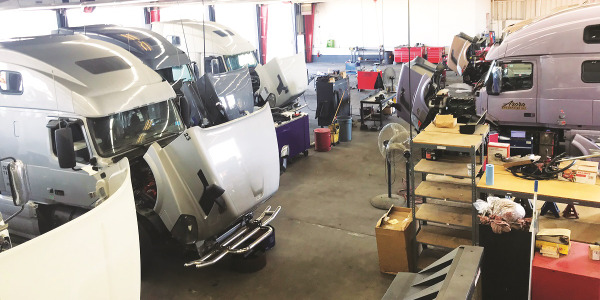 When maintenance and repair are turned over to an outside service provider, there may be some catching up needed to ensure all the trucks in the fleet are up to date on their maintenance needs. 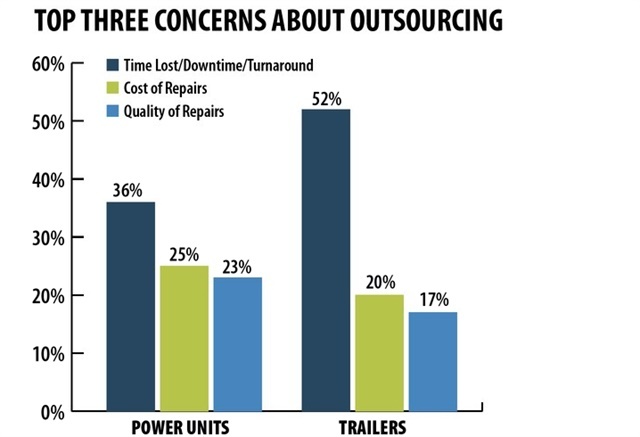 Downtime is the biggest concern keeping fleets from outsourcing more work, according to MacKay & Co. research. The RP includes a section on repair and maintenance services that are required and what is available, sets forth an authorization process, provides information on technician certification, and gives labor and parts pricing, among other things. Nothing makes a relationship sour faster than lack of communication. In fact, Greer believes a service provider can’t communicate enough with a fleet. “Communicating information in real time is becoming more and more important,” he says. If it were up to Calhoun, the telephone would disappear as a means of communicating during service events. “It has always represented a bottleneck in our world,” he says. TMC is working on an RP on the transparency part of the service equation. “The task force has laid out some guidelines covering what information should be going back and forth and how that data should be shared. We are trying to get to the point where the fleet knows what we know when we know it. That is the ultimate goal,” he says.